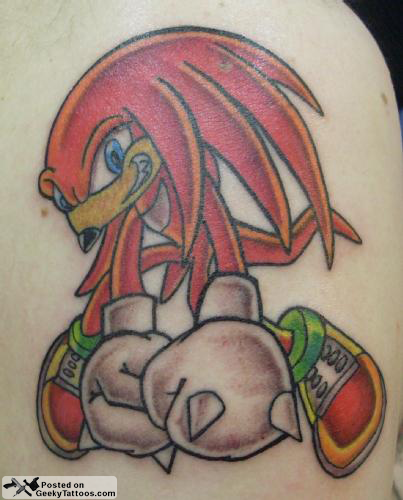 Sadly this tattoo of Knuckles isn’t on someone’s knuckles. It’s actually on Henrique Barudi‘s right shoulder. He got it done to remember the good times in the 90s when he and his brother spent their vacations playing Sonic on the Sega Genesis. He got it done at Foz do Iguaçu (aka Iguassu Falls in Brazil) by Kleber. Tagged with Kleber, knuckles, Sega Genesis, shoulder, Sonic. curto, boto fé e é o prenuncio do 90's remember. Eu também passei muitas férias à base de Sonic..bateu até uma nostalgia.